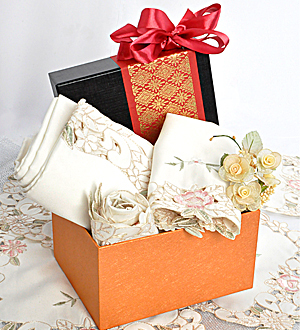 A warm gesture and an ideal gift for the new home. An exclusive Syrian Tamerria embroidered Table Cloth and Table Mats for 6 measuring 54" x 74" and 12" x 18" respectively. Gift presented in a Nuscomit box. Divesti Embroidery Table Cloth is an ideal gift for Birthday, Housewarming, to Congratulate or simply to say 'Thank You', 'I'm Sorry', 'Well Done' or "Be Happy".